Stockholm 2015: Danish furniture manufacturer Carl Hansen & Søn has refreshed a 1970 tray table by Modernist designer Hans J Wegner with a pale and smoked oak veneer. Carl Hansen & Søn has released two versions of a table originally designed by Danish designer Wegner, which combines a reversible wooden tray top with a collapsible metal stand. The table takes the name of the manufacturer's model number, CH417. The company had a long-standing relationship with Wegner, who designed more than 500 chairs before his death in 2007. Wegner's well-known Wishbone chair featuring a distinctive Y-shaped back is among the original designs the company continues to produce. The Danish furniture manufacturer has now re-issued the original tray table design – with one black and one white laminate surface – as well as an updated version that features one light and one smoked oak surface. As in the original design, the thin veneer surfaces are bound together by a natural oak hoop and carried by a smoked oak handle. "Hans J Wegner's tray table is an extremely versatile and functional piece of furniture that doesn't take up a lot of room and offers versatility through its multiple visual options," said head of Carl Hansen & Son, Knud Erik Hansen. "It is, in many respects, an item that embodies the spirit of our times and responds to the growing desire for multifunctional furniture," added Hansen, whose company currently produces a range of furniture by Wegner. 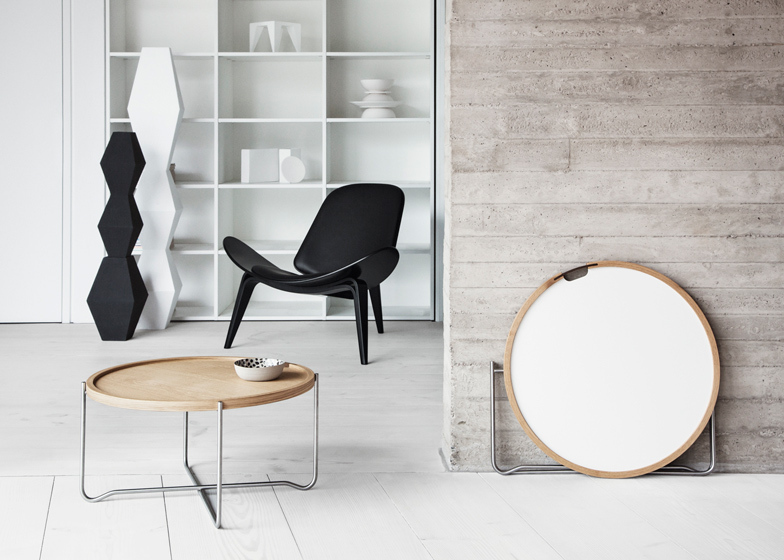 Both editions of the 65-centimetre-diameter tray top rest on a low tubular-steel base. The stand is made from two bracketed frames that lock together to form a base with a crossed-shaped footprint. It can be collapsed for easy storage, allowing the tray to be used independently for serving. In keeping with the 1970s design, a single piece of curved smoked oak is slotted into a notch in the natural oak edging of the tray, providing a handle. "This enables the user to carry the tray while adding a refined, functional detail to the design – a well-known Wegner signature," said a statement from Carl Hansen & Son. The table originally formed part of a larger collection by Wegner, featuring armchairs and sofas with bent tubular bases. The tray table is the only remaining piece from this collection still in production and will be available from May. To celebrate the 100th anniversary of Wegner's birth last year, Carl Hansen & Søn reinstated the designer's 1950 logo for the company that features the initials CHS in swirling white lettering on a white background. The brand also put a 1955 wood and steel chair by the designer into production for the first time.